ATLANTA (August 3, 2017) — Agencies and brokerage firms reported that their organic growth rebounded to 4.6% in the second quarter of 2017, a surprising reversal from the 3.9% reported in the first quarter, which was the weakest growth rate since 2011. Several factors appear to have reversed the earlier slippage. These include a stronger-than-expected U.S. economy, more favorable property-casualty pricing and organic growth gains in both commercial and personal lines, said Kevin Stipe, president of Reagan Consulting, a management consulting and merger-and-acquisition advisory firm for the insurance distribution system. Profitability, defined as agent-broker earnings before interest, taxes, depreciation and amortization (EBITDA), also reversed course, surging to 24.6% in the second quarter, Stipe noted. “In previous quarters, EBITDA margins have continued to recede, and first-quarter 2017 was the lowest among our surveyed brokers in five years. That changed in the second quarter, though, when brokers reported an EBITDA margin of 24.6%, up from 23.1% in the year-earlier quarter,” he said. 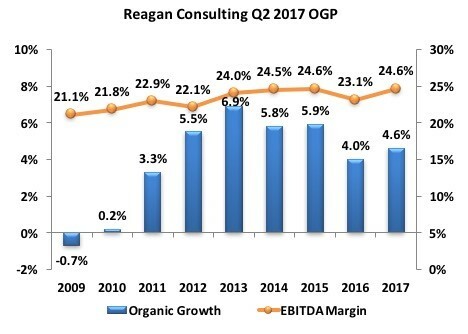 Reagan Consulting cautioned that EBITDA margins tend to hit their highest level in the first quarter, due to the reporting of contingent income, and decline over the course of the year. “Pleasant surprises in the second quarter were robust organic growth in commercial lines, which rose to 3.9% from 3.1% a year earlier, and in personal lines (2.3% from 1.7%). The 2.3% organic growth in personal lines was the fastest growth rate since 2013,” Stipe said. “What makes the personal lines result even more encouraging for agencies and brokerages is the fact that many observers suggest this business is vulnerable to technology-driven disruption and potential disintermediation,” he said. Merger and acquisition activity remains very strong, with historically high deal volume over the last two years, Stipe pointed out. “That pace is continuing in 2017, with 255 deals reported by SNL Financial in the first six months, ahead of the 221 reported in the same period of 2016. The question on many people’s minds is, ‘How long can this trend last?’ When Reagan Consulting looked closely, we made a stunning discovery,” he said. For further information and commentary, contact Kevin Stipe of Reagan Consulting at 404.869.2532 or kevin@ReaganConsulting.com.